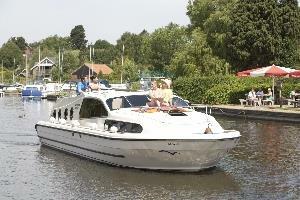 Offers luxury holiday cruisers and riverside lodges on the Norfolk Broads, Britain's newest National park. Enjoy a holiday afloat, on board one of our luxury cruisers. Enjoy the beautiful surroundings, relax and recharge. Hunters Yard, is located in Ludham, where Percy Hunters unique Fleet of traditional wooden 1930s sailing yachts await your arrival. 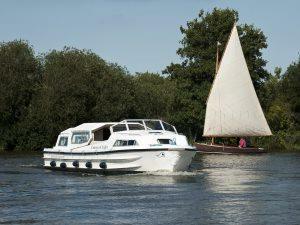 Our Yard sits within its own secluded private dyke in the heart of Norfolk's world famous Broads. Martham Boats has a wide range of hand-crafted traditional wooden motor cruisers with 3 to 9 berths and 2 - 8 berth yachts to hire, most of which were built here at our boat yard in Martham during the 1940's and 1950's. We have a fully accessible bungalow which sleeps 10, and can be hired for a weekend or a few days; you can also spend a day or a half day on boating activities with us. Everyone is welcome - please contact us for more information. 300 boats for hire along with a wealth of information to assist the first time boater and regular Broads sailor. RYA recognised sailing school. A range of residential sailing courses available for adults and families in Norfolk Broads Cruising yachts. Also ""taster"" sessions to introduce people to sailing. Traditional sailing cruisers with beautiful handling characteristics, up graded for your comfort and ease. Relaxing family holidays or a romantic break for couples. Whether you're looking for a Broads holiday, require your craft renovating or a new boat, Silverline Marine can help.